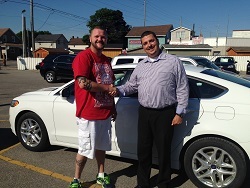 My experience with Davey Auto Sales was nothing short of absolutely fantastic! From the second I walked into the office to the exciting drive off the lot, I received nothing but honesty. Kris McDonald and his team are definitely straight shooters…no huge mark ups..no run around on rates..they treat you with respect and give you their best upfront! Your Superior customer service and honest reliable staff have ensured that my family and I will be back in the future for our driving needs! Thank you for the beautiful addition to our family!! !